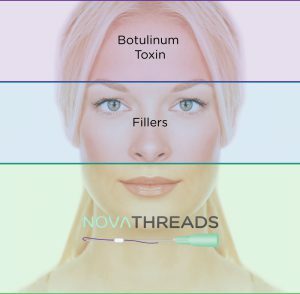 NovaThreads are hypodermic needles pre-loaded with a polydioxanone (PDO) absorbable surgical suture that your skin will fully consume within 4 to 6 months. FDA-approved, these sutures are commonly used to perform open-heart surgery and is one of the safest materials to be implanted in your body. In aesthetic applications, there are a variety of threads available to lift the skin or to provide collagen stimulation where desired. What can NovaThreads be used for? Am I a candidate for a PDO Thread Lift? For certain patients, the use of NovaThreads in a PDO Thread Lift can provide a natural looking rejuvenation of the face. * Whether alone or in conjunction with other injectable treatments and laser technologies, NovaThreads is an excellent micro-invasive method for rejuvenating and lifting the skin. Dr. Quibell will explore all options available to you during your consultation in our Wellesley office, using her 20 years of experience to help guide you to the optimal treatment plan for your personal aesthetic goals. Interested in learning more about NovaThreads?